Once again the writers of Girl Who Reads are participating in the A to Z Challenge. The main challenge is to blog for 26 days, but since we already publish 6-7 days a week, I challenged myself and the other writers to try a different style and to create better headlines. 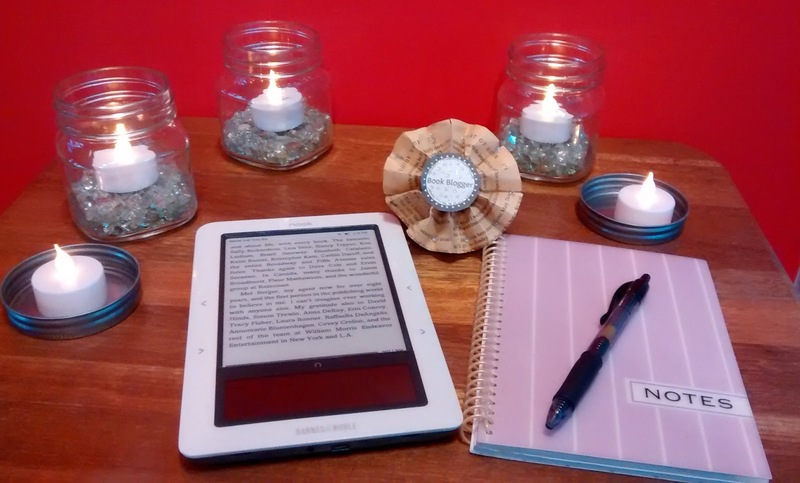 For those readers joining us from the A to Z Challenge, Girl Who Reads focuses on books, the reading experience, and writing. Even if you aren't much of a reader I hope you find something interesting here. Like many book bloggers, I don't have an English degree or much of a background in literature. I review books because I love reading and want to share that passion with others. especially when I find a great book. For that reason, I'm always looking for information on ways to write better reviews. A technique I've recently been reading about is active reading. I picked up the textbook Literature: An Introduction to Reading and Writing at a recent library sale and in the opening chapter active reading is demonstrated. 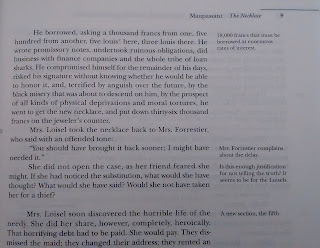 The short story "The Necklace" by Guy de Paupassant is used as the study text. This is a short story I remember reading in high school. I've kind of admired people who annotate their text, though I don't do it. Partly it is because I don't like my handwriting, but the larger reason is because I thought that the notes were some deep understanding that they were jotting down. After reading through the notes for The Necklace, I realize that is not always the case. In active reading, you are using all your sense and taking an active role in your reading. Perhaps it would be best to contrast it with passive reading. Passive reading is what most of us do in our everyday reading. We read the words on the page, maybe not ever one of them. We synthesize enough to understand and enjoy the story. Passive reading is why we often can't remember details, especially those from early on in the story, when we finish the book. Recalling details, emotions, and thoughts are hallmarks to writing an awesome book review that fully conveys your opinion of the book. Through active reading, you will be able to say more than "It is a great book!" You will be able to back up your claims. Active reading is actually quite easy, though it may be a bit more time consuming until it becomes a habit. If you don't like writing in books, or you are reading digital files, you may want to pick up a notebook. It doesn't have to be anything special. Pick a style and size that is comfortable to you. I like spiral notebooks that are roughly 5"x6" as it fits into by purse, but it still has a good amount of writing space per page. If you read multiple books at a time in different places you might want separate notebooks so you can keep one with each book. How do you keep up with your reading notes? Even if you do annotate in the margins, you will still want something with more writing space to record longer thoughts than can fit in the margins. This may be a notebook or index cards or just a notepad. Now that you have the tools for active reading, start reading! With each paragraph read, record your observations. "Many observations, particularly at the beginning, are assimilative; that is, they do little more than record details about the action. But as the story progresses, the comments reflect conclusions about the story's meaning. Toward the end, the comments are full rather than minimal; they result not only from first responses, but also from considered thought." pg. 3 Literature: An Introduction to Reading and Writing (fifth edition). So don't be afraid of just making simple notes at first. These notes may serve you well when trying to recall details about particular characters or settings. As you get deeper into the story you may start making better connections to what came before and understand more character motives and relationships. It may also draw you the author's subtle uses of language and writing style to convey a deeper story. 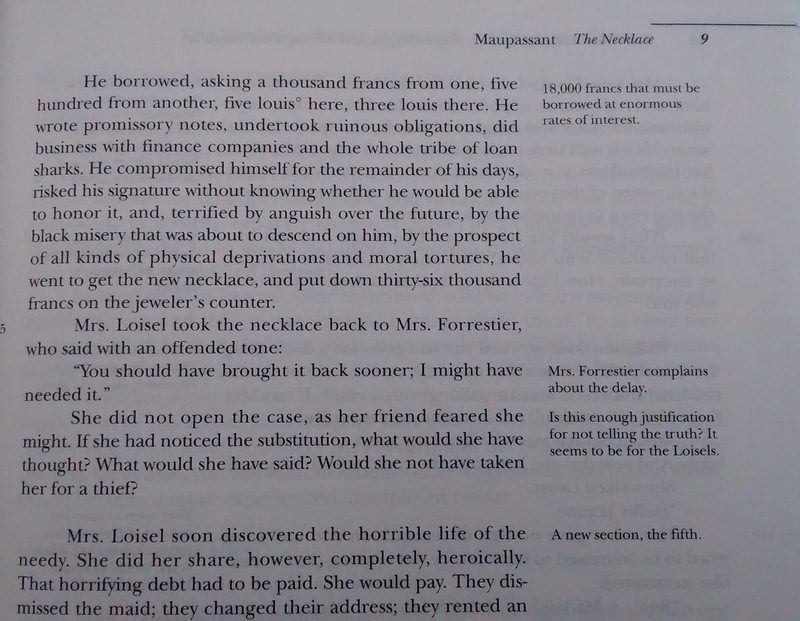 As I mentioned, I've read "The Necklace" before (albeit more than 20 years ago), but in reading through it with the annotation I noticed details I missed. For example, how manipulative the wife is. Or that the husband, who clearly wants his wife to be happy, was looking forward to a vacation without her. Observations for basic understanding. This is the who, what, where, what, and how of the story. Also, write down unfamiliar words and things you don't understand about the story. Notes on first impressions. As reviewers, we are pretty good at this guideline. It is the emotions the story evokes, what you liked or disliked about the story and characters, etc. Try to explain why you think what you do about the story. Development of ideas and enlargement of responses. These notes will make your reviews awesome. Dig a little deeper into the story and character motives. Go beyond your first impressions of a character or situation. Also, note literary devices that where used and your thoughts on their effectiveness. A greater appreciation of the characters. I love character driven stories and active reading can connect you more to the characters by revealing characteristics, habits, etc that you may not register or remember in passive reading. A deeper appreciation for the author's writing. By more closely reading the story you will discover nuances that might otherwise have been missed. It is the subtle foreshadowing or a play on words, if not paying close attention are missed, but add a richness to the text. A better appreciation of themes. Themes are not unique to literary fiction.They are present in genre fiction but are often overlooked as we get sucked into the story. Discussing themes is an important component to an awesome review. Should you always read actively? When reading for your own pleasure, don't feel like you have to actively read. If the author has done his/her job, you will thoroughly enjoy the story and the "me time". However, if you are reviewing a book and you want to write the most awesome review, then active reading is the key. Found you! Great post - looking forward to more! Thanks for stopping by. I think we have a great month of content planned. Sometimes those awkward moments occurr because you have only ever read a word so when you do speak it, you mispronounce it. I'm glad it will be useful. I'm so bad about taking notes, but I'm really going to try to do it more. Good advice! I'm a voracious reader, but I tend to forget a lot of the details after I finish a book. Me too. I feel really bad when I write the review and I can't remember a character's name. I usually have two or three books going at the same time, so I think active reading will help me keep everthing straight. What a great post. I kind of like that I can "report" as it were on my reading a particular book on Good Reads. That I don't have to write a proper review up front but that I can submit progress notes as I go. I use Goodreads's progress notes as well, but not as often as I should since I usually use my reading time to "unplug". But if something really hits me that I want to remember, I will get my phone out and update my reading so I can save the note. This is a really good tip. I love to read, and am good at using a highlighter, but sometimes that is not good enough. I'll revisit a highlighted sentence or passage later, and it won't have the same revelatory feeling as when I originally read it. Guess I should get in the habit of jotting down some notes. I don't like to write in my books or more often I'm reading an eboook. But I've made notes on Goodreads and then not been sure why I noted. Active reading, taking notes, is an excellent way to keep track of what you want to say in a book review. Now just to put it into practice. Great advice! I am going to give it a try with 100 Years of Solitude. I keep re-starting it and later set it aside. By the middle, I have forgotten necessary details from the beginning. I've read books like that, and I always feel like I've let myself down. Like if I could remember the details the story would have been so much better. Great info! I do occasionally like to review books for fun, and I've found that they real like an 8th grade book report. Maybe this will help me go a little deeper. Thanks. Since I review a lot of books, I feel like my reviews get repetive and very surface level. Like I will say it was a great book, but I can't remember any specific reason that it was. So I just keep saying "great story, great characters, great writing, etc." What a great idea! I will give that a try next time! I'm getting ready to start a new book for review and I'm going to put these tips into practice. I was a biology major so notes in books were mostly highlighting text which drove me nuts. But I can see how handwritten annotations in literature would make you feel connected to the readers that came before you. Oh, active reading is an interesting idea. I generally pay a lot more attention to various things when I know I'm supposed to be reviewing the book for a review site. (I review all the books I read - just some reviews are dinky little things meant for my own record-keeping.) Thank you for teaching us about active reading! Books that I didn't accept for review, I usually just write a few sentences for my own record-keeping as well. But for the books I take on as reviews I feel that I need to put in more effort and more details. Informative post. Active reading benefits everyone. Thanks for stopping by. I thik active reading can benefit everyone. You can get so much more out of the story when you activing engage with the text than just mindelessly reading the words on the page. Thanks for stopping by. That is some great advice. Maybe more people who shy away from writing a review (because they feel they don't know how) would be encouraged to do so by reading your post. Well-done! Thanks! I think a lot of people want to leave me than the great book type reviews but aren't sure how. It's a topic I write on from time to time for that reason. Very helpful! I did this in college, but had stopped as my reading became more pleasure-driven vs academic. I'm going to utilize this when I read my next book for review! Even pleasure reading can benefit from some note taking at times. Sometimes stories are so complex that I think they become more enjoyable with some reflection. Very good post. I read 1000 words a day and I write a 1000 words a day. I hope I can make my writing as active as my reading after reading this. Thanks. That's a great goal. I try to read every night before bed.